The Ford 6.0 Powerstroke started being used in the Ford Superduty pickups in 2003. While these engines did have their fair share of problems, they could be made to be reliable performers. We actually have several trucks in our shop fleet that have 250k+ miles on them and they run great. But sooner or late comes a time when you will need to rebuild the engine. There isn't a ton of solid reference material out there that covers everything you will need. First things first, how do you know if you need to rebuild your engine? Besides the obvious hole in the side of the block or horrible tap noise coming from the bottom end, the determination usually is decided after doing a compression test. When you try to look up a spec for this you will find some confusing information. Ford does not actually give an actual number for compression. They only say that all cylinders must have no more than 25% variance between them. We'll give you some better guidelines. So if you check your engine and have two cylinders at 300 and six at 350, you may have the beginning of a problem. Usually engine will still seem to run ok around 300 psi, but they are getting worn out. Most of the time when you are looking for a problem you will find a cylinder that only has 0-100 psi. Then you know for sure the engine needs rebuilt. When you have made the decision that the engine has to come out for a rebuild, removing them is very simple. The cab does not have to come off to pull the engine as many people tend to thing. Everything easily unbolts from the front the radiator/grill area making for easy removal. You will have to remove the turbo and filter housings on top of the engine, but everything else can stay and be pulled at once. The engine assembly can be pulled right out the front with a regular engine hoist. Once you have the engine out, disassembly is pretty straight forward. There is a balancer on the rear of the crank that is held on by six bolts that will prevent you from removing the camshaft. You can take this balancer off, but make sure you keep it with that crank. They are machined at the factory and can only be used on that specific crankshaft. If swapped with another crank it will cause an engine vibration. We always advise hot tanking the heads and block to clean them up. This removes all the deposits from the oil and coolant passage ways that could cause blockage. Starting with a perfectly clean block and heads gives you new motor a better chance of living the longest life possible. If you find that your heads need more than the .008” removed to clean them up, we do have cylinder head shim kits available. These kits will allow you to take up to .020 off the surface of the head while still maintaining valve clearance and pushrod geometry. Also know that there are two different dowel sizes for the cylinder heads. 2003-early 2006 trucks have 18MM dowel pins. Engine built after 1/2006 will have 20MM dowel pins. 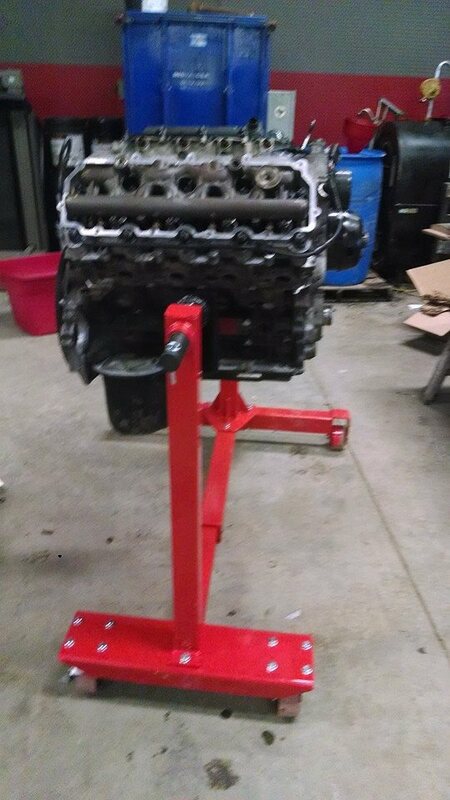 You have to make sure you order the right size head gaskets when you order your engine kit. Next you need to inspect the cylinder bore. You want to be able to see the factory cross hatch in the cylinder wall. It is surprising how many high mileage engines we tear down that still have the cross hatches and very little cylinder wear. You will need to check piston to cylinder wall bore clearance to make sure it is in spec to see if you can reuse your pistons and simply put rings on them or if the block will needed bored to a larger size. If you find that your bore clearance is out of spec or if you have some sort of cylinder wall damage, you will have to bore all the cylinders to the same size. It is not recommended to bore just one cylinder to a larger size. There are several sizes available in over size pistons for this engine. Select the nearest size that your cylinder will clean up with boring.